With a prestigious grant from the Asian Cultural Council, Hammer adjunct curator James Elaine moved to China in April 2008 to seek out emerging artists within China and throughout Asia. This blog provides a fascinating insight into Jamie’s travels and the art world in China. 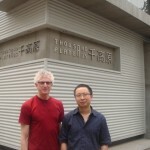 This photo depicts Jamie and Liu Jie outside of 1000 Plateaus just before the earthquake. James Elaine was in Chengdu, China, during the May 12th earthquake. He recounts the events of that day below. I came to Chengdu to meet with the artist Chen Qiulin and to be introduced to many of the artists there. Chengdu and Chongqing are both home to many important and well known contemporary Chinese artists, but they are a long way from the art capitols of Beijing and Shanghai. After a day of sightseeing with my friend and translator Deng Tai ("Tai Tai") we met with Liu Jie, director of the 1000 Plateaus gallery and Yu Ji, performance artist, for dinner on Sunday night. They took us to the most wonderful and beautiful Sichuan Hot Pot restaurant I have ever experienced. It turned out to be a very important meal. While ordering ten dishes, Qiulin asked me if I liked duck tongues. I stopped, thought for a second, and then elatedly turned to Tai Tai to tell him about my new Hammer blog and to translate to them my utter excitement about eating duck tongues for the first time. Although I'd eaten duck and a duck's head, I had never eaten duck tongue. I told them how important it was for me to eat duck tongue since I'd named my blog after it. After dinner we retired to a beautiful tea garden where we met a few other artists and drank tea and beer late into the night. The next morning I was picked up by Liu Jie. 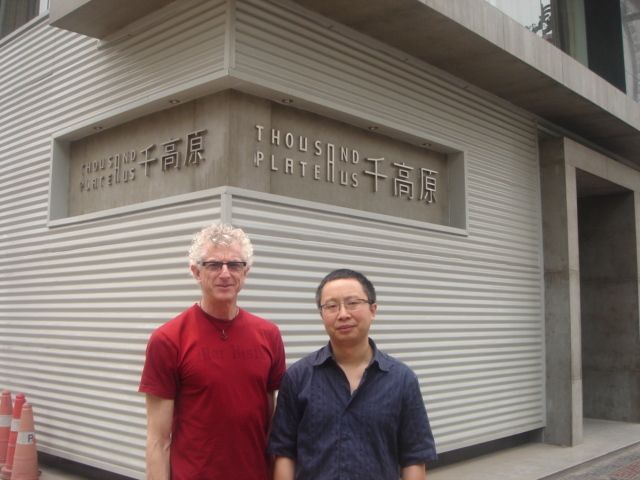 We went to 1000 Plateaus, a beautiful space and, in my mind, the only gallery in Chengdu with an important international contemporary exhibition program. Tai Tai joined us to translate and we began looking at Liu Jie's inaugural exhibition catalogue. After about half an hour or more of drinking coffee and discussing what I was doing in China and Liu Jie's vision for the gallery I felt a bit of rumbling on the floor. I thought at first someone was stomping up the stairs and shaking the floors. But the shaking persisted. I looked around to see if they felt any alarm. If we had been in NY it could have been the subway. But we were in Chengdu and the subway was not yet finished being built. All of a sudden the shaking became violent, the walls and floors were swaying and jumping, the gallery staff raced into our office screaming at us to get up and run. We grabbed whatever was next to us and ran to the stairs. The shaking got worse as we stumbled, almost falling, down the stairs and headed to the front door. Outside was total chaos, people were running, screaming, yelling. The quaking continued. The 1000 Plateaus building (maybe 10 stories high?) separated slightly from the building next to it, chunks of granite surfacing split and fell to the ground shattering as it hit near us. After a few minutes the rumblings subsided, people were frozen in fear, and then aftershocks followed, sending the masses into more panic. We began running for the middle of the nearest intersection, power lines swaying above our heads as we ran. People were ashen faced and in shock as they stared up at their buildings and searched for their families and friends. The buildings are quite old here and not earthquake proof. As far as I know there has never been an earthquake in Chengdu. And this one was centered just 60 km from the city, registering at 8.0 on the Richter scale, and was felt clear across China. As of my writing over 70 to 80,000 people have died and countless injured, the numbers increasing daily. After a few hours of just waiting in the streets and feeling the tremors we all decided to try to make our way to our respective homes. A gallery employee drove me to my hotel. I should have walked as it took an hour or so to go a just few long blocks. When we arrived the hotel had closed and evacuated all of the guests who now were all sitting outside in front on the grass. This was not an isolated case: all hotels, businesses, shops, apartment buildings were emptied and tenants not allowed back in. Of course no one knew what was going on or what would follow or how long this would all last. There were people everywhere, on the sidewalks, in the streets, in parks and parking lots.the hospitals even had to move all the patients outside. Tai Tai did not abandon me, but stayed by my side the entire time to help me figure out what we could do next. The next day was like a strange dream. The weather was much cooler and it began to rain. Aftershocks sporadically continued. I was supposed to have traveled to Xi'An for meetings at Ma Qingyun's new artist city XCOMA, but the airport was closed, everything was in limbo, breathless even, no one knew what was going on, only the horror on TV of 1000's of people killed and hurt in the Wenchuan earthquake. We were so fortunate to be alive and well, so many people lost their homes, livelihood, family members, lives, everything. But in the heart of a disaster you can always find a love story. Everywhere I looked I saw people -- complete strangers -- helping each other, caring for the lost, living and sleeping together in makeshift tents all over the city. I can't tell you how much I love this city now and this country. I feel that I have become one of them. I did not want to leave Chengdu for the relative safety of Xi'an, although Xi'an also suffered from the quake, I wanted to stay with my friends to support them in this time of uncertainty.